After spending hours and hours on your website generating content and promoting it, uploading products, interacting with your followers through comments, and so on, the worst thing that can happen is that all the fruit of your work evaporates overnight because of an unexpected event. All those hours invested, all that effort, all your digital legacy…. just gone! If you have been a cautious person, I bet you had some backups of your site. That is, from time to time, you created a snapshot of your website and stored it in a safe location, so that when the unexpected (and usually inevitable) occurs, you can recover this snapshot (AKA a backup) and everything you had in a couple of clicks and a few minutes. In general, a backup is a copy of some information you want to preserve so that, in the (likely?) event that something goes wrong and you end up losing said data, you have a safe copy from which you can restore it. For instance, if your website crashes, a malicious user cracks into your website and breaks it, or you accidentally remove something important from your web, a recent backup would give you the means to restore your website to its previous state, before the harmful event occurred. How often should you create new backups depends on how often your web changes. For most websites, making a new backup every 24 hours will be more than enough (you can even consider doing them once a week or even once a month). In fact, daily backups are what most hosting providers do. But if there’s new stuff on your website continuously, you should consider backing up your data more often so that, in the event of a failure, your last snapshot is as recent as possible and, therefore, what you might lose is as little as possible. Many people keep the backups of their website on the server where they have the website hosted, and that is a huge error. The idea of having a backup is to make sure that it is safe; if the server crashes and our copies are there, we will have lost the web and the backups themselves. So just make sure you store your backups somewhere else, somewhere safe. For instance, save them in your hard drive on your computer, or in a cloud storage service like Dropbox or Google Drive, etc. And what about the backups made by the hosting providers themselves? Well, in principle, you could assume that they are already following this basic principle of having the backup in a safe and different place than where your own website is hosted, but asking about this issue would do no harm before commiting to one provider or another. But even then we can’t forget that they may also have some problems and lose your backup, so it’s best to always have some redundant copy that you can control. Now that we have a clear understanding of what backups are for and the importance of keeping them safe and sound, it’s time to talk about how to actually backup your site. There are many ways to do this, but today I’m going to focus on backup plugins for WordPress. 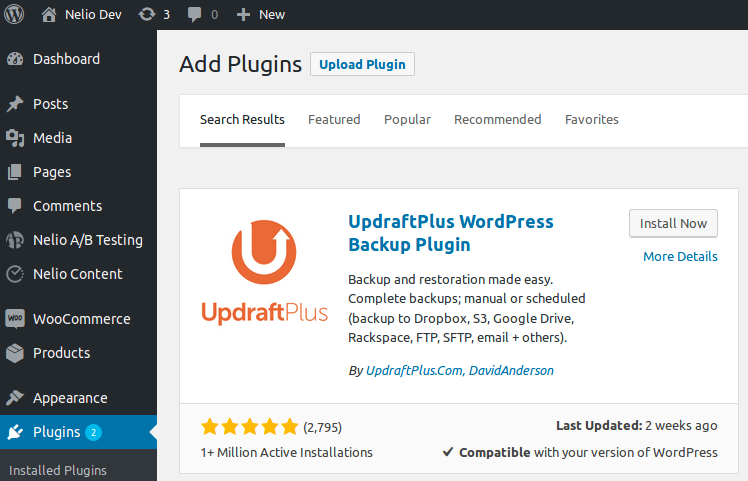 There are numerous plugins in WordPress for backing up your website, both automatically and on demand. Some typical examples are BackupBuddy, UpdraftPlus, Duplicator, VaultPress by JetPack, etc. If you want to know more about them and their pros and cons, take a look at this post by wpbeginner. So let’s get our hands dirty and learn how to install and configure UpdraftPlus, how to create a backup with it, and how to restore it if necessary. If you’re wondering why this plugin in particular… well, it’s just because I’m used to it, but any other plugin would have probably done the job too. 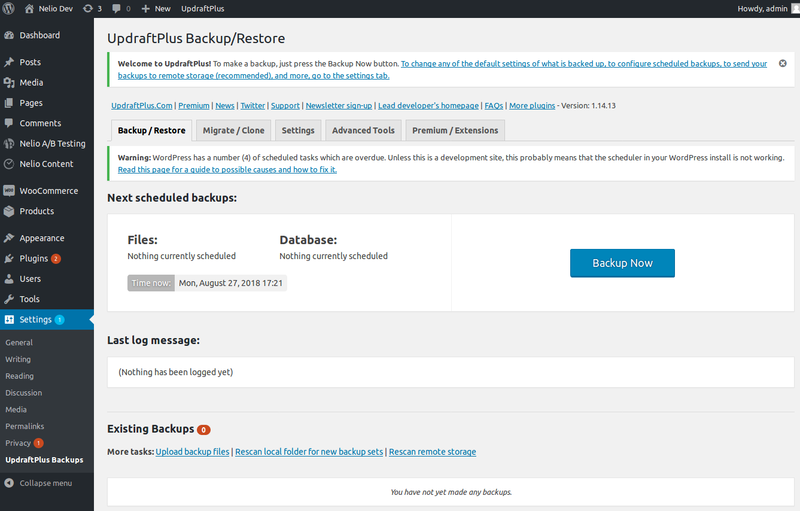 You can easily look for UpdraftPlus Backups on your WordPress Dashboard. Then simply install and activate it as you always do and you’re done. 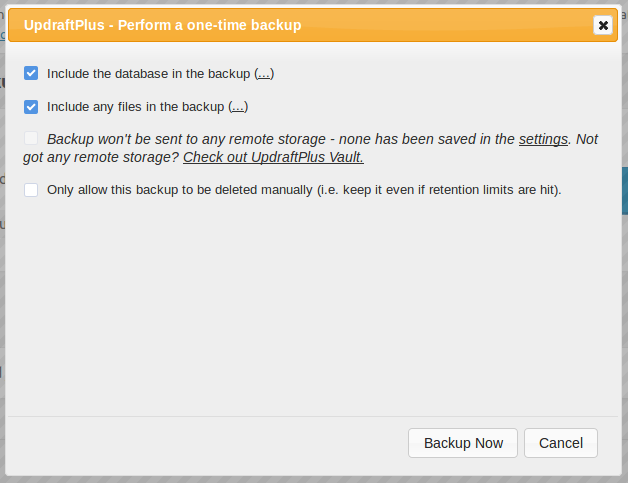 If there were no issues, you should now have a new option in the Settings menu called UpdraftPlus Backups. Since this is your first backup, use the default options, click on Backup Now, and just wait for the backup generation process to end (which takes a while, depending on how big your installation is and how powerful your server is). 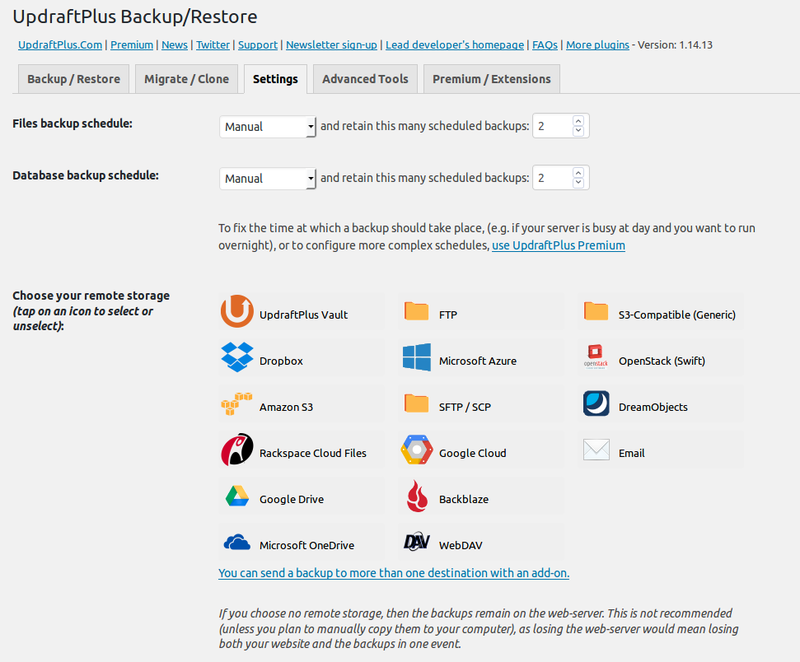 Under the Settings tab in UpdraftPlus, you’ll find some interesting options for customizing how often should it backup your site and where should it store the backups. Files backup schedule. In this case, we can decide how often a backup copy of the plugins, themes, and files we upload to our website should be created. If you don’t update the website often or update it a couple of times a week (like us, for example), weekly or even monthly backups can be the most convenient way to do it; in the end, if something fails, you’d lose just a few images from your media library. Database backups schedule. The database contains all the actual content of your website: pages, posts, comments… Again, the frequency you should use here depends a lot on the frequency with which you update your website, as well as the level of participation that your visitors have with it. In my opinion, it’s worth using a higher frequency than the one used for files… but it’s up to you. The second part of the settings is precisely the remote location where you store your backup. That is, by configuring one of the available sites (Amazon, Dropbox, any FTP server, e-mail, etc), UpdraftPlus will automatically send a copy of the backup when it’s completed. This way, you won’t have to worry about it being in the same server as your site. At this point you may be thinking that, hey, if backups are so cool, why not create a copy every 4 hours and make sure I never lose anything? Because it’s expensive, that’s why. Indeed, if you have the means, the more recent your last backup, the better, because the less information you risk losing in the event of a failure. But of course, storing the backups on the server itself takes up space (and therefore costs money), and downloading those copies to your computer or transferring them to external services also costs money… so just use a setting that suits your needs and your budget. But what if your backup is not on the server? Just click on the Upload backup files link to upload it to your server and, once it’s ready, follow the procedure we just described. 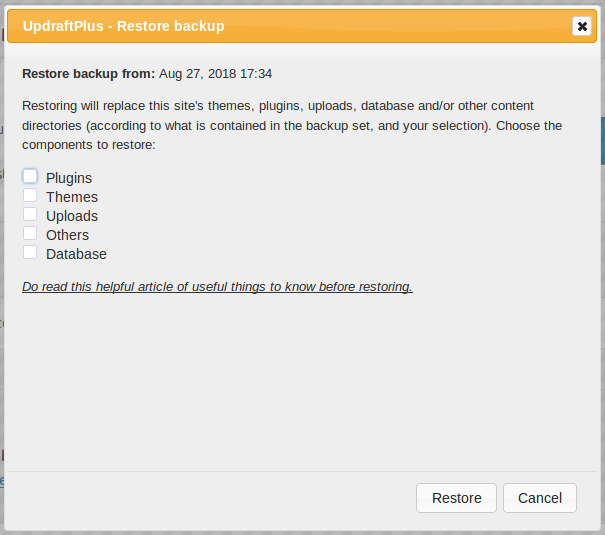 As you can see, creating backups in WordPress and restoring them is extremely easy if you use one of the many plugins that exist for it. The most important thing is to always keep in mind that a backup is supposed to be our plan B, and so we have to make sure they’re stored somewhere safe. 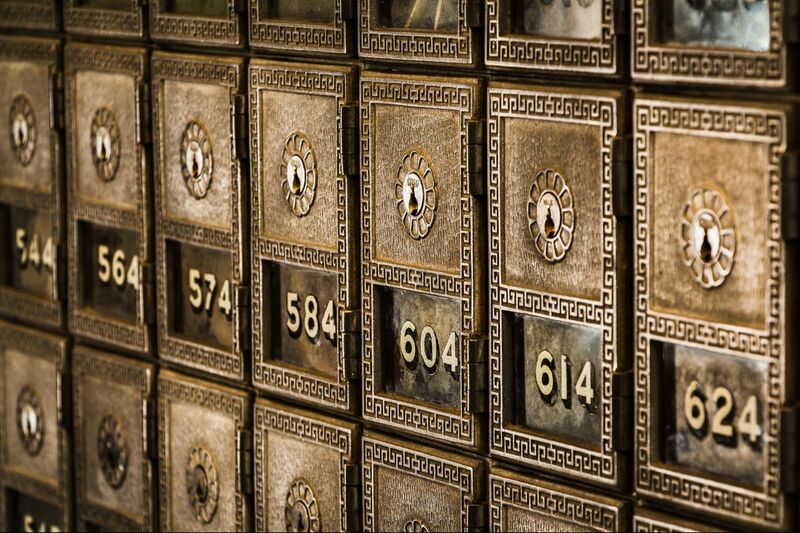 Backup your site right away and don’t risk your online legacy anymore! Featured Image by Tim Evans on Unsplash.